Keeping updated on the latest trends in material science across a wide range of industries can be an intimidating task. Realizing this imperative, PRISM is set to organize International Conference on Materials Science and Engineering which is going to take place during September 04-06, 2019 at Melbourne, Australia with a view to promote awareness and enhance research aiming in developing solutions for the challenges encountered. 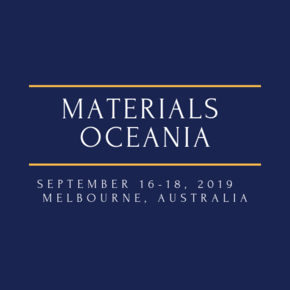 Materials Oceania aims to bring together leading academic scientists, industrialist, research scholars, students, delegates and exhibitors to exchange and share their experiences, research results about all aspects of Materials Science, Nanotechnology, Chemistry and Physics. This engineering conference is also providing a platform to the companies and/or institutions to present their services, products, innovations and research results. Meet the Objective Business sector with individuals from and around the globe concentrated on finding out about Materials science and Engineering, this is the best chance to achieve the biggest collection of members from all over the world. This conference will leads you to get disperse data, meet with current, make a sprinkle with another product offering and get name acknowledgment at this occasion. Widely acclaimed speakers, the latest methods, strategies, and the most up to date overhauls in Materials science and Engineering are signs of this meeting.